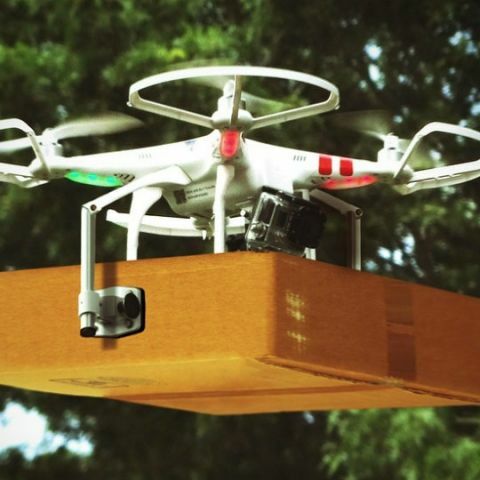 Zomato says that its first order of business is to design multi-rotor drones that can pick up a payload under 5 kg. Zomato could soon be making food deliveries using drones in India as the company has acquired TechEagle Innovations, a Lucknow-based startup that works exclusively on drones. The company hopes that this acquisition will help it “carve a path toward drone-based food delivery in India, creating a hub to hub delivery network powered by hybrid multi-rotor drones.” TechEagle was founded back in 2015 by Vikram Singh Meena and the startup develops unmanned aerial vehicles, more specifically, custom-made drones that are said to be capable of carrying payloads of up to 5kg. The company has not specifically mentioned when consumers can expect their food being delivered by drones, but this could soon be a reality since it’s no longer illegal to fly drones in India, given one takes flying permission and meets a certain criteria. Zomato says that it currently delivers 22 million orders in a month and boasts of a last mile delivery fleet of 1.5 lac partners. It also recently expanded the reach of its online ordering and food delivery business to 100 cities in India and announced its Zomato Gold subscription service in Jakarta and Manila. “Zomato is one of the most innovative technology companies in India, and the only company with a singular focus on food. We are excited to be a part of the team and together build something which will certainly play a significant role in the future of primary and secondary logistics in the food supply chain in India,” muses Vikram. Speaking of drones, one can fly a drone legally in India starting December 1, 2018, given that one registers it online on the Digital Sky Portal. The new policy called “Drone Regulations 1.0” states the details of conditions under which one can operate a drone in India. This new policy decrees that Nano drones, which weigh less than or equal to 250 grams don’t need a registration. However, drones belonging to the remaining categories, Micro, Small, Medium, and Large, need to be registered on the portal. Once registered, a Unique Identification Number (UIN) or Unmanned Aircraft Operator’s Permit (UAOP) will be issued by the DGCA (Directorate General of Civil Aviation). For a new UIN, one will need to pay Rs 1,000, while a fresh Operator Permit will be issued with a five-year validity and cost Rs 25,000.